ZQ510 Mobile Printer – Optimized for tough environments where a high duty-cycle 3″ (72mm) receipt or invoice is needed, and can also print labels for medium-duty-cycle applications. ZQ520 Mobile Printer – Optimized for tough environments where a high duty-cycle 4″ (104mm) receipt or invoice is needed, and can also print labels for medium duty-cycle applications. 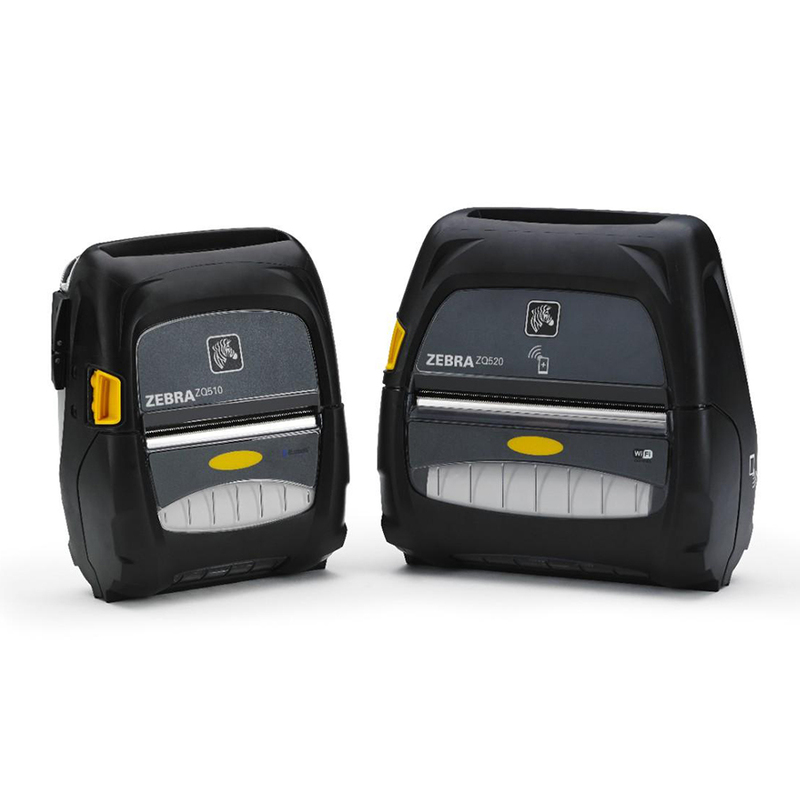 Zebra’s ZQ500 Series Mobile Printers are used in the following industries: Transportation, Retail, and Manufacturing. Mobile work environments can be abusive for hardware. The ZQ500 printers are lightweight, yet engineered to handle the bumps, drops and collisions that are part of the job. The ZQ510 and ZQ520 printers feature a patented military design that meets third-party-verified MIL-STD 810g military standards for shock, vibration and temperature exposure. The printers can withstand repeated drops to concrete from 6.6′ on multiple sides — and when paired with the optional exoskeleton case can withstand drops from 10′. And for additional protection, the ZQ510 and ZQ520 printers are designed to guard media from being ejected when the printer is dropped, keeping your workforce productive and focused while on the move. To keep your employees on task and on schedule, the ZQ500 Series are the first Zebra products to support a secondary Bluetooth communication channel, an innovative feature that allows one channel to send print jobs to the printer while a second channel performs additional functions such as device management. ZQ500 printers also feature “draft mode,” which optimizes the printing speed (5+ inches-perminute) for text-only printing. And with Power Smart Print Technology™, the printers can anticipate what users will print, saving batter power yet delivering fast, high-quality receipts and labels. The ZQ500 Series comes standard with the latest in Bluetooth connectivity: Bluetooth 4.0. The printers also offer 802.11a/b/g/n WLAN connectivity that supports both 2.4GHz and 5GHz bands and roaming within and across bands. And, with the multiport radio, your employees can simultaneously operate 802.11a/b/g/n and Bluetooth 3.0 — meaning they can be constantly updated and connected. If users lose their Bluetooth connectivity while on the road, Print Touch™ via NFC technology serves as an alternate option, ensuring users are always connected. The ZQ500 Series is “Made for iPod / iPhone / iPad” (MFi certified) and Wi-Fi Alliance-certified, offering connectivity to a range of Apple, Android and Windows Mobile devices. The ZQ500 printers are lightweight, yet engineered to handle the bumps, drops and collisions that are part of the job. The printers feature a patented military design that meets third-party-verified MIL-STD 810g military standards for shock, vibration and temperature exposure. The printers can withstand repeated drops to concrete from 6.6″ on multiple sides. Zebra not only protects your hardware, but also your operational uptime. The ZQ500 printers meet IP54-rating for resistance to dust and liquids that are common in mobile environments – from dirt in the field to crumbs in a service vehicle. And with cold temperature compensation, the ZQ500 Series automatically optimizes and balances print speed and print quality in cold temperatures.